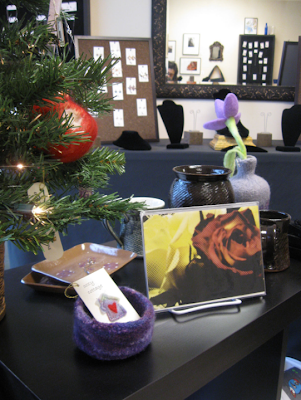 The Boston Handmade Holiday Gallery season in Downtown Crossing is in full swing! We have new handmade gifts arriving weekly from all 25 of our local exhibitors, our displays are bursting with holiday cheer, and we would love to help you find that perfect gift for everyone on your list. The gallery is located at 505 Washington Street, right between Temple Place and West Street, in the heart of Boston's Downtown Crossing neighborhood. We are open Wednesdays through Sundays from 11am to 7pm each day. In addition to our annual gallery, there is another location where you can see work by members of Boston Handmade during this holiday season. Boston Handmade member Cristina Hurley has recently opened her own studio/gallery for fine jewelry and local crafts located in the center of Canton, MA (at 3 Rockland Street). Cristina designs and creates original, fine pieces of jewelry in silver and semiprecious stones right in her shop and this month she is featuring handmade work by other members of Boston Handmade. If you are looking for special, handmade crafts to give to your love ones, make sure to pay visits to both Cristina's shop in Canton and the Boston Handmade Holiday Gallery in Boston. Support your local artists this year and buy handmade this season! How nice! Everything looks great, my best to Boston!